The Archdiocese of Boston Permanent Diaconate Office Web Site contains information for permanent deacons, people interested in the permanent diaconate, and our extended community. See pictures from the celebration here. 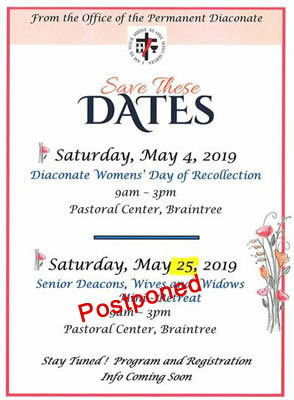 From time to time, Deacons of the Archdiocese of Boston may be requested to assist and/or preach at weddings, baptisms, funerals and other liturgical events outside the Archdiocese of Boston. In those cases it is required by the bishop of the diocese in which the deacon hopes to minister that a "Letter of Good Standing" be provided to him or his delegate certifying that the deacon is indeed in good standing within his own (Arch)diocese. In certain instances, dioceses may also require a "Statement of Suitability for Ministry" which is a certification that the deacon is of good character and reputation and qualified to perform his Diaconal duties in an effective and suitable manner. Who is the permanent deacon? Copyright Archdiocese of Boston Permanent Diaconate Office. All Rights Reserved.